Financial backers of the Los Angeles Clippers have been withdrawing their support after the basketball club's owner allegedly made racist comments. The National Basketball Association is investigating remarks reportedly made by Donald Sterling, 80. Four firms, including Mercedes Benz USA, have cut sponsorship, while energy drink maker Red Bull is among companies to have suspended advertising. The NBA has called a news conference for 18:30 BST on Tuesday. In a 10-minute taped recording posted online by celebrity news website TMZ, a man, alleged to be Sterling, can be heard criticising a woman for posting photographs of herself with black friends attending Clippers' matches on a social media website. Sterling, who has owned the Clippers since 1981, has told TMZ the recording "does not reflect his views". On Sunday, Clippers players staged a silent protest, going through their pre-match routine for their NBA play-off game against Golden State Warriors with shirts on inside-out to hide the team's logo. The players also wore black wristbands or armbands and all wore black socks with their normal jerseys. 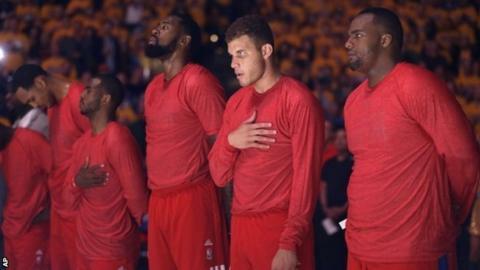 The Clippers, who lost the game 118-97, play their first home game on Tuesday since the racist remarks became public. Clippers coach Doc Rivers says he has declined to speak to Sterling and urged fans to support the players. "We need unbelievable support and I hope that's what we are going to get from our fans," he said. "I was asked if I needed to talk to Donald. I passed. I don't think now is the right time, for me at least. "I believe he said those things but I want to make sure it hasn't been doctored. "I heard what he said. Until someone tells me differently, you usually believe what people say. I will wait for that further judgment." NBA star Magic Johnson urged NBA commissioner Adam Silver to act quickly over the allegation. "There's no room for racism and discrimination," he said. "Unfortunately, this is a man in a powerful position and a man who should be embracing minorities not discriminating against them."